My babies are 20 months apart. I had my newborn lying down in the stroller and my older sitting up. Easy to maneuver, light and cool looking ride. My "but" is to the stroller being hard to push with one hand. Most moms are in need of a coffee or tea while pushing the stroller. 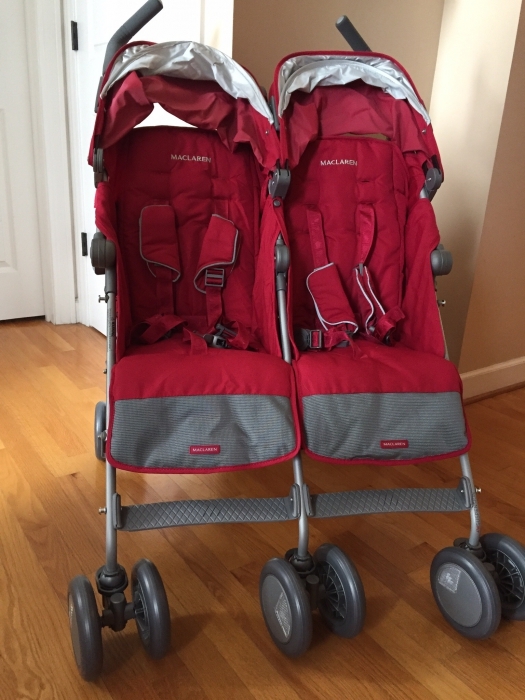 I'm due with twins and really had a hard time choosing a double stroller. They were either too flimpsy and cheap, too heavy and bulky, or not practical and expensive. So, when I came across the Maclaren I was very excited! It folds quite small and maintains a lite weight. The features and additional products that can be purchased are great, and the PRICE Albee Baby has it on sale for is AMAZING!!! I decided that having a stroller that thier Uppa Baby car seats would connect too wasn't worth it. Research shows babies shouldn't be in thier car seats other than when in the car, so I can see the trend of travel systems dwindling. Plus, if babies are use to being moved back and fourth, it should make them stronger sleepers and easier to change diapers and what not without have a big car seat in the way. I am puchasing the carrycots since I'm expecting the twins to be preemie in size for extra comfort while in use. 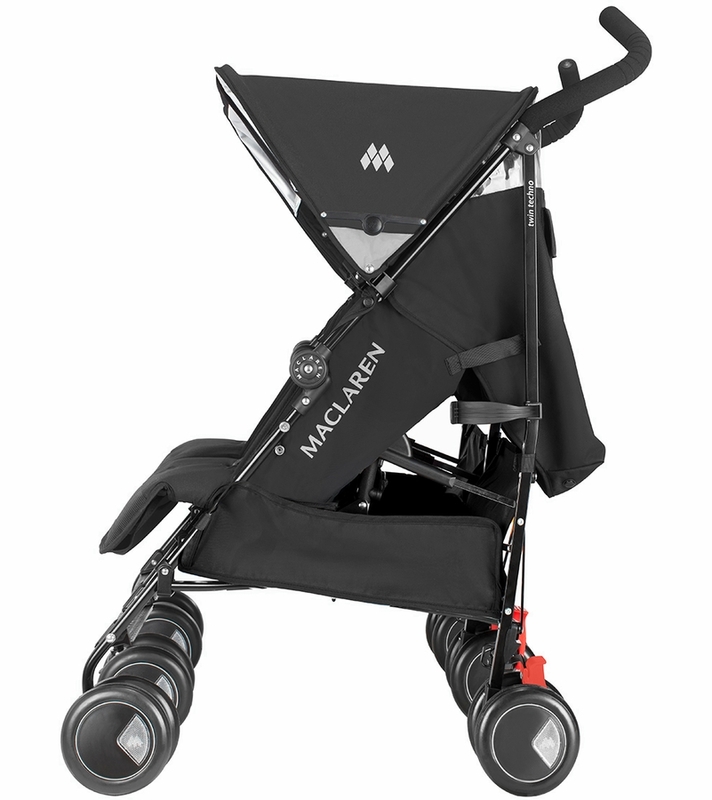 My Maclaren will stay in my car and be used as my out and about stroller. 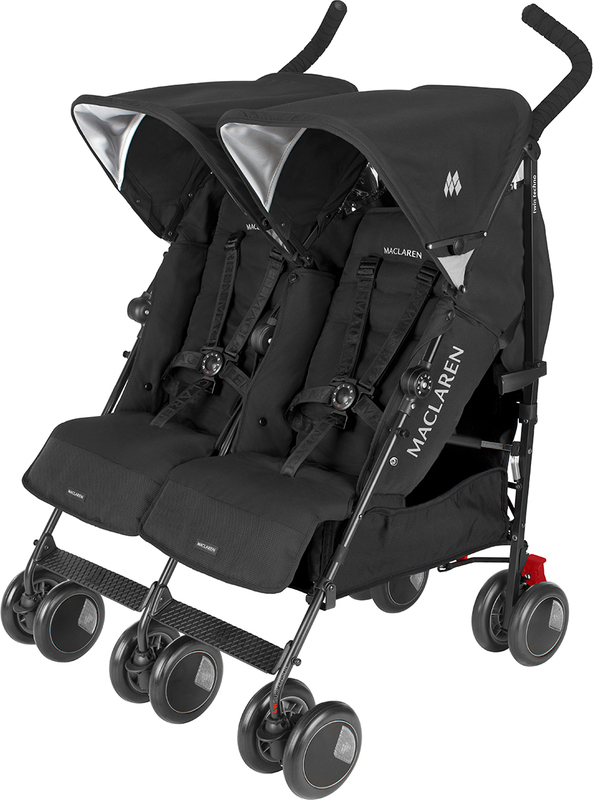 This will be my second Maclaren but first twin version. I also feel that the Twin Techno is much nicer and has larger wheels that the Twin Triumph if you are shopping around and confused on the differences. Its such a great stroller I want to use it everyday. Its so nice and easy to maneuver, fits perfectly through a doorway. I have a almost two year old and a 5 month old and it is perfect for them. I wish the sun shade was a little larger. I hope to use this stroller for many years to come. This particular stroller comes with many extras. Why didn't I purchase this sooner?! We purchased this stroller for our upcoming trip to Disney for our 3 yr. old and 5 month old. It is perfect. We used it last weekend for a trip to the zoo and fell in love. It doesn't feel like you're using an umbrella stroller. The seats recline almost all the way back. The foot rest comes up (perfect for napping and especially for infants) And it comes with so much....a sac for infants to keep them warm, head cushion for infants, rain cover, wrist strap for handles, cup holders. Definitely worth the price! ProsComes with lots of accessories. I'm giving this a 4 because the sunshade comes off easily after popping open a few times and closing when your out and about. It's also heavy for an umbrella stroller. MacLaren produces quality products. We are happy with how comfortable the stroller is to push for my 6'7" husband and how comfortable the stroller is for the 6 month and 5 month old babies. It's relatively easy to use, although not quite a one handed open and close. It has two cup holders, one for each parent or for multiple water bottles for a longer walk. The babies fall asleep in it each time we go out for a walk. We are very happy with this purchase. I have the baby jogger city double and this is a great complement. It fits through every doorway and takes up so much less space than my other stroller. 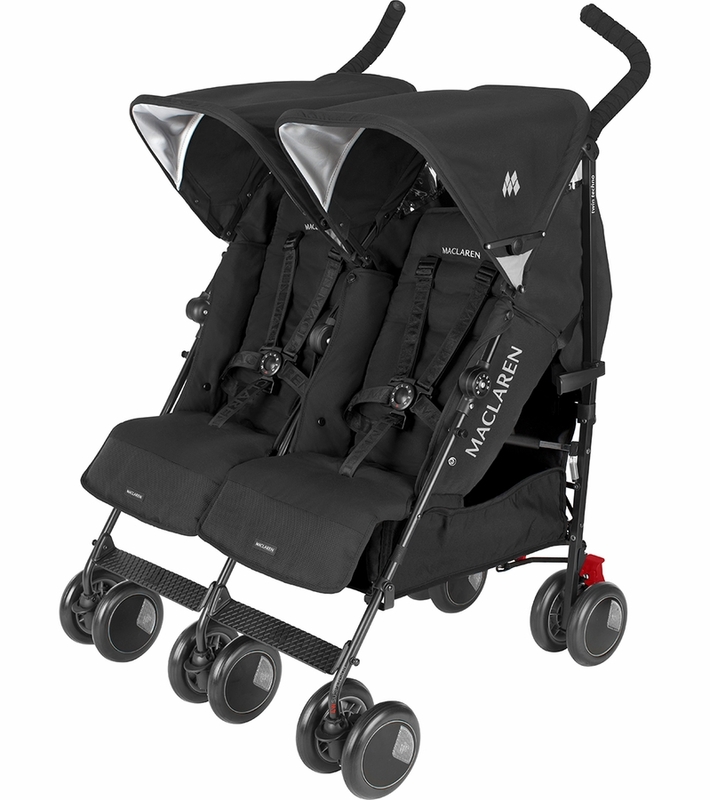 I love my baby jogger for the heavier duty days but this is a great everyday lighter weight stroller. It comes with great accessories as well. Very pleased with the quality. 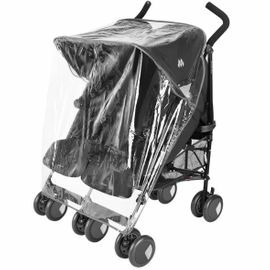 ConsSlightly heavier than some other umbrella strollers but prefer the better quality over the light weight. Best UsesEveryday use that isn't off road. I have a 17 month and a 2 month old and this stroller is perfect to accommodate them.its a bit heavy but very convenient and doesn't take up much space..5 stars all the way! ProsFolds flat,accommodates my 17 month old and 2 month old very well. So far so good! First maclaren purchase and using this as our twin travel. The buckles aren't the easiest to clasp. Great for kids that want to unbuckle, but my kids aren't interested in doing so anyway.Super fast shipping and great price! we are very happy with the stroller is exactely what we were looking for, for a very good deal. Thanks!!! I did a lot of research before buying this double stroller. I have a 2 yr old and a 2 months who fit in very comfortably in this. 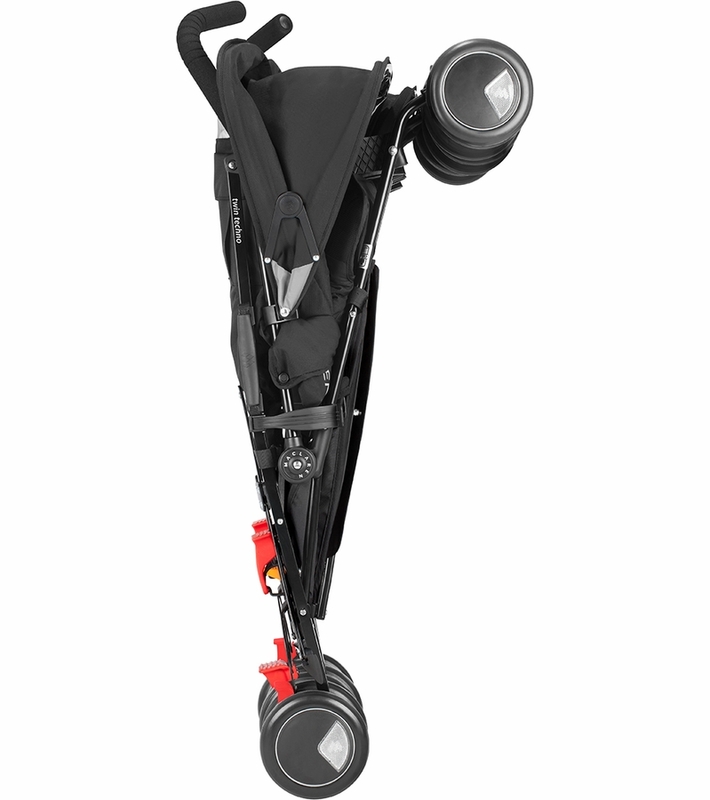 If you live in a city like New York or San francisco then this is the stroller you need to buy. 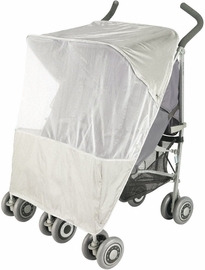 This comes with everything you need to comfort your child such as weather shield, foot muff , head rest. It is made of strong aluminum metal but yet folds like a umbrella stroller. Constoo heavy to push around . The stroller itself is 30lbs without kids in it. 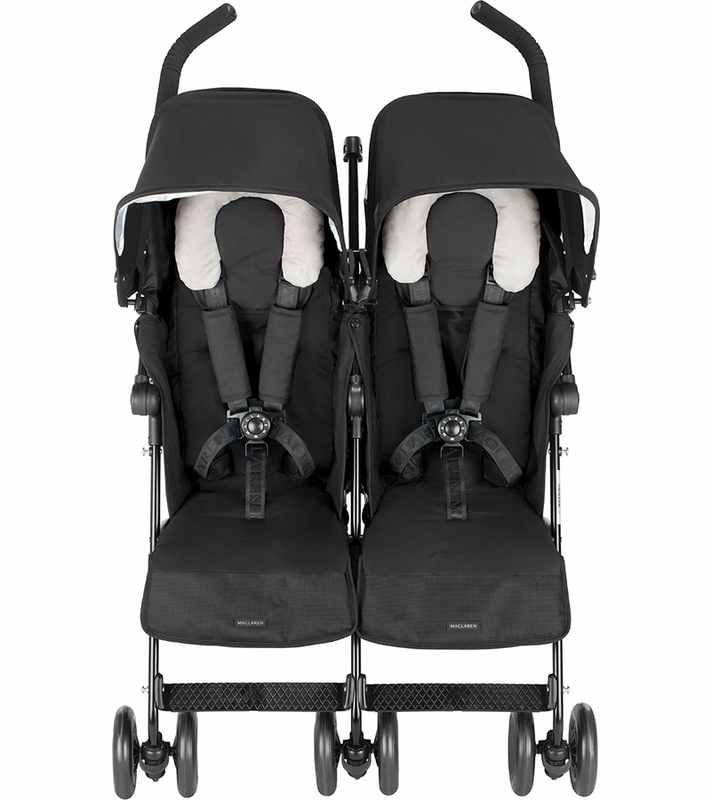 This is a perfect, hassle free double stroller. We bought this for a Disney trip, and are thrilled with our purchase. 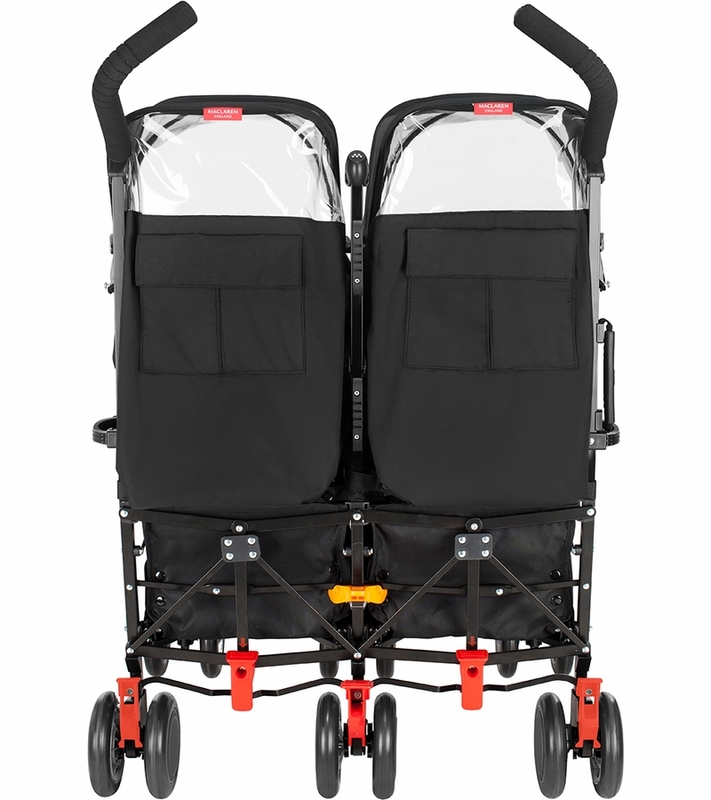 It holds my 3 year old and 1 year old very comfortably, folds easy, comes with lots of accessories, is easy to lift (in regards to a double stroller), and takes up less space than other doubles.